Only 6 more days until the new Catalog starts and I am so excited! Stampin Up has come up with some seriously cute stuff in the new Catalog and I can’t wait to get it. All of it! Ok, maybe not quite all of it, but I’m definitely ordering the cupcake stamp set that I showed on Monday and the new Foxy Friends with coordinating punch too. Who am I kidding? Every time I open the new catalog, I add something new to my wish list. Today’s stamp set is one that I got at OnStage in April. Everyone who attended received it as a gift. 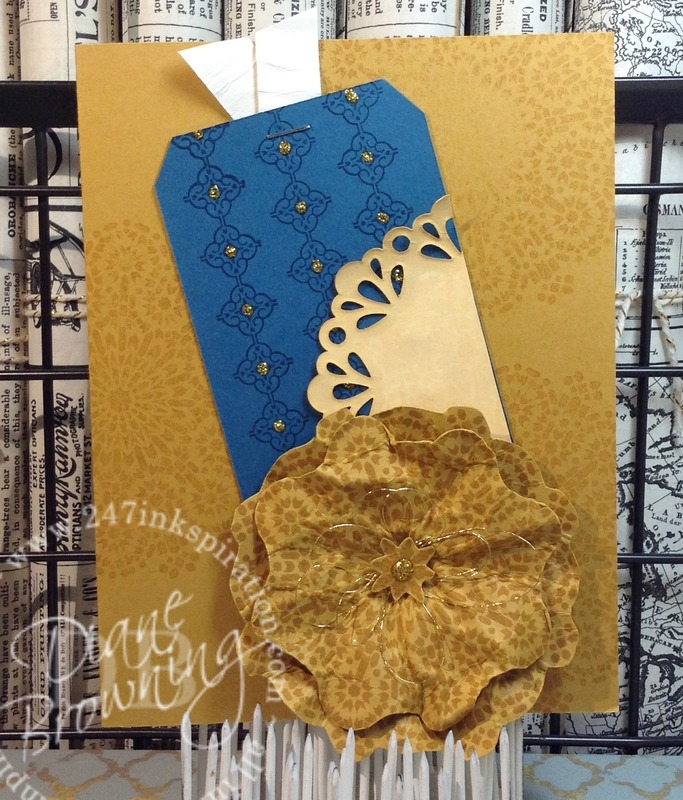 This is one of the samples Stampin Up created and showed us at OnStage. First, let me apologize for the quality of the picture. I was taking a picture of the giant tv screen in a dark conference room. The medallion image is embossed. The tassel from baker’s twine with some gold threads added in to give it that rich Moroccan look. Can you see that little thing behind the tassel? That is one of the lamps from the set and it’s been embossed in gold and hangs on some twine with the tassel. I really wish the color was better on this card because it was so elegant in real life. I’m still trying to get use out of my soon to be retiring stamp sets, but I really wanted to play with some new goodies too. I used the big medallion and stamped it three different colors. The measurements for the white card stock are 4″ by a smidge less than 1.75″. I think my “smidge” is about 1/16th”. I tried it at 1.75″ and there just wasn’t enough room between the three panels so I trimmed off a “smidge”. This card that I made and was inspired by another one that I saw on Facebook. I went back to see who made that card and wouldn’t you know it, I couldn’t find it. I hate when that happens, I really like to give people credit when they inspire me. Speaking of inspiration, at our Downline Meeting last week two of the ladies made swaps using this same set. I had to share them because I want you to see how versatile this set is. Both of their cards are so very different and so pretty. This card was made by Lyndi. I love how she used the Gold Dazzling Details on the tag. It gives it that extra little something. This card was made by Annette. Annette used the two little lamps from the set. They are embossed with the brand new Copper Embossing powder which will be available June 1st. The pattern paper she used is from the Affectionately Yours Designer Series paper, which will also be available June 1st. Are you sold on this set yet? Add it to your wish list so you can play along too! Moroccan Nights 141715 (WM) 141718 (CM).